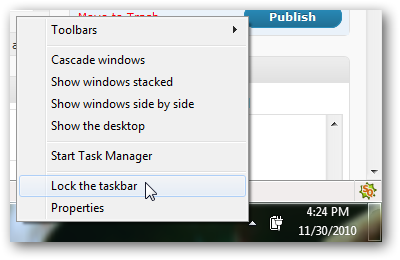 While the new taskbar in Windows 7 has t a dramatic improvement in the usability of many functions, there are certain tasks that are not so easy to put to the “superbar” for the user; for example, move files to the Recycle Bin. And although the Recycle Bin icon is still present by default in the desktop Windows 7, many users prefer to keep your desk completely clear and free of icons. 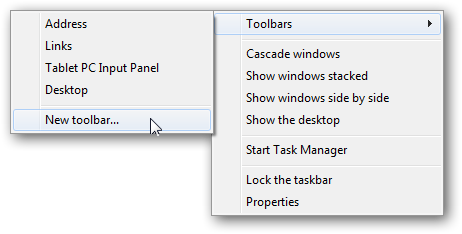 So, we will show you a trick to anchor the Recycle Bin at taskbar in Windows 7, retaining the functionality of drag and drop , ie allowed to delete files by simply dragging the icon in the superbar. Subsequently, right click again, this time on the Quick Launch, uncheck the boxes “Show text” and “Show title”, and “View” menu choose “Large Icons”. You can even empty the recycle bin directly from the superbar on right click over it. This Article Has Been Shared 7218 Times! Cite this article as: Abhishek Ghosh, "Anchoring the Recycle Bin to Windows 7 superbar," in The Customize Windows, November 30, 2010, April 21, 2019, https://thecustomizewindows.com/2010/11/anchoring-the-recycle-bin-to-windows-7-superbar/.